View the status of agents. 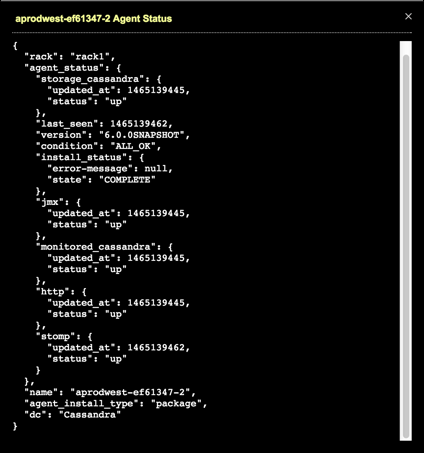 Agent status automatically updates in the list view as the information becomes available within OpsCenter. If displayed in the Agent issues detected banner at the top of the OpsCenter workspace, click the Show Details > problems link. Any DataStax Agents that need attention appear at the top of the list. If there is a problem with an agent connection to OpsCenter, the issue and status is clearly indicated in the appropriate column. When available, additional error details display by hovering the mouse pointer over the warning icon. Pending: Agent installation is waiting for installation. Installing: Agent installation is in progress. Error: Agent installation failed. Hovering the mouse over the warning icon displays error message details. Inactive: Agent installation completed without error but OpsCenter detected no activity from the agent. Active: Agent installation completed without error and OpsCenter has detected some activity from the agent. Note: Agents may still have problems with individual services with an Agent Status of Active. This is expected when agents are running but may be misconfigured.